how is the lume on this watch? First-time poster... Long story short a local AD for Tudor was having a liquidation sale so I went in to see what they had. Ended up buying a Tudor Black Shield for a pretty good deal. Got home and had buyers remorse as I wear suits 4 days a week. Dealer carries Breitling so told me he would give me store credit , but no refund since it was a liquidation. 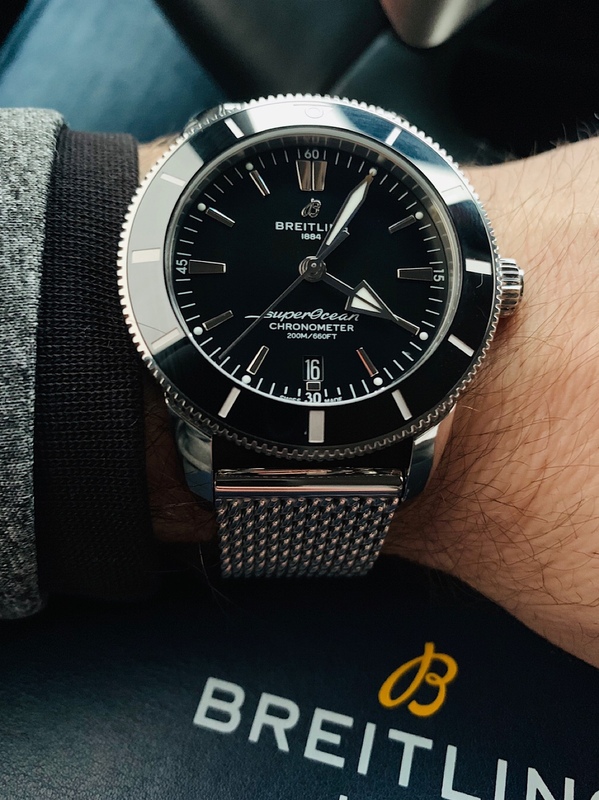 Don’t know much about Breitling, but since I was “handcuffed” went ahead and purchased the Breitling Superocean Heritage II B20 Automatic in 46mm case with mesh bracelet. Love the larger watch and the mesh bracelet. But of course, as soon as I left and started reading forums, the Breitling naysayers (especially over Omega) were prettt strong. Looking for your thoughts on this watch. I live in Kansas Citybso had it shipped to my work address on the Missouri side to save sales tax so don’t have actual pics, but have attached website pics. I’ve been a Tag Heuer wearer previously, mainly because I don’t know much about watches. Probably why I’m having a hard time deciding if I went the right direction or not. Great looking watch, clean dial. Enjoy it! 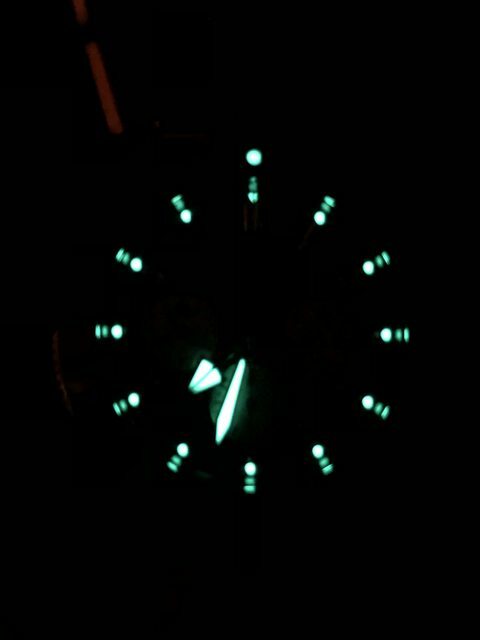 Here's the lume on my new Superocean Heritage Chrono. Big congrats, the watch really looks good. Ditching a Tudor-you did well. Huge upgrade. Great watch, I had the SOH46 blue dial for several years, had to let it go as it was sitting right at the limit of my 7in wrist. Very fine watches, the only issue is resale value is about 50% of list. If you don't care about selling it every, not a concern. I was thinking of buying the same watches. I like black and silver colors. They combine each other, and the watch looks amazing. Breitling is one of my favorite watch brand, i already have two and plan on increasing my collection. That is a really splendid watch. Congrats. Very nice, and solid watch! I just made a deal for a Superocean II, it will be my 3rd Breitling. In my experience of owning Omegas, TAGS (first watch mistake) and of course Rolex, the Breitlings hold a soft spot for me. As long as you aren't paying retail they are incredible values and hold up like tanks. Congrats on your purchase! I think you went towards the right direction, it's for sure a step up from the TAGs. I have the same watch except in 42mm and it was before the ceramic bezel model came out. The metal bracelet pictured is the one I have as well but I don't like how it feels on my wrist, so I usually wear it with a rubber strap. It's more comfortable and the clasp for it is really adjustable. Coming from a Rolex though, the Breitling does feel like a downgrade. It's not a bad watch by any means but I can feel the difference in quality between the two brands. I have a strong feeling that they remedied that by offering a ceramic bezel like the one on yours, because comparing my ceramic Submariner to a previous 16610 aluminum bezel Submariner gives me a similar impression. I also enjoy how Breitling encourages the use of different bracelets and straps with the purchase of your watch because it can really transform it into something completely different. I recommend buying a rubber and/or leather strap if you have any interest in those, because it can make the watch perfect for a multitude of occasions. I got two rubber straps for free as long as I bought the clasp (they use a different clasp than the one used with the metal bracelet), and since this isn't Rolex you can definitely get a deal like that. Enjoy it!! Nice and congrats. I have serveral Breitlings and they are tough as nails. Value retention is not good, but if you buy for the pleasure of it and can afford it, there's nothing wrong with that. Try to flip it and you'll take a huge loss.